The Great Pyramid of Giza (also known as the Pyramid of Khufu or the Pyramid of Cheops) is the oldest and largest of the three pyramids in the Giza pyramid complex bordering what is now El Giza, Egypt. It is the oldest of the Seven Wonders of the Ancient World, and the only one to remain largely intact. Based on a mark in an interior chamber naming the work gang and a reference to fourth dynasty Egyptian Pharaoh Khufu, Egyptologists believe that the pyramid was built as a tomb over a 10 to 20-year period concluding around 2560 BC. Initially at 146.5 metres (481 feet), the Great Pyramid was the tallest man-made structure in the world for more than 3,800 years. Originally, the Great Pyramid was covered by casing stones that formed a smooth outer surface; what is seen today is the underlying core structure. Some of the casing stones that once covered the structure can still be seen around the base. There have been varying scientific and alternative theories about the Great Pyramid's construction techniques. Most accepted construction hypotheses are based on the idea that it was built by moving huge stones from a quarry and dragging and lifting them into place. There are three known chambers inside the Great Pyramid. The lowest chamber is cut into the bedrock upon which the pyramid was built and was unfinished. The so-called Queen's Chamber and King's Chamber are higher up within the pyramid structure. The main part of the Giza complex is a setting of buildings that included two mortuary temples in honour of Khufu (one close to the pyramid and one near the Nile), three smaller pyramids for Khufu's wives, an even smaller "satellite" pyramid, a raised causeway connecting the two temples, and small mastaba tombs surrounding the pyramid for nobles. It is believed the pyramid was built as a tomb for Fourth Dynasty Egyptian pharaoh Khufu (often Hellenicised as "Cheops") and was constructed over a 20-year period. Khufu's vizier, Hemon, or Hemiunu, is believed by some to be the architect of the Great Pyramid. It is thought that, at construction, the Great Pyramid was originally 280 Egyptian cubits tall (146.5 metres (480.6 ft)), but with erosion and absence of its pyramidion, its present height is 138.8 metres (455.4 ft). Each base side was 440 cubits, 230.4 metres (755.9 ft) long. The mass of the pyramid is estimated at 5.9 million tonnes. The volume, including an internal hillock, is roughly 2,500,000 cubic metres (88,000,000 cu ft). Based on these estimates, building the pyramid in 20 years would involve installing approximately 800 tonnes of stone every day. Additionally, since it consists of an estimated 2.3 million blocks, completing the building in 20 years would involve moving an average of more than 12 of the blocks into place each hour, day and night. The first precision measurements of the pyramid were made by Egyptologist Sir Flinders Petrie in 1880–82 and published as The Pyramids and Temples of Gizeh. Almost all reports are based on his measurements. Many of the casing stones and inner chamber blocks of the Great Pyramid fit together with extremely high precision. Based on measurements taken on the northeastern casing stones, the mean opening of the joints is only 0.5 millimetre wide (1/50 of an inch). The pyramid remained the tallest man-made structure in the world for over 3,800 years, unsurpassed until the 160-metre-tall (520 ft) spire of Lincoln Cathedral was completed c. 1300. The accuracy of the pyramid's workmanship is such that the four sides of the base have an average error of only 58 millimetres in length. The base is horizontal and flat to within ±15 mm (0.6 in). The sides of the square base are closely aligned to the four cardinal compass points (within four minutes of arc) based on true north, not magnetic north, and the finished base was squared to a mean corner error of only 12 seconds of arc. The completed design dimensions, as suggested by Petrie's survey and subsequent studies, are estimated to have originally been 280 royal cubits high by 440 cubits long at each of the four sides of its base. The ratio of the perimeter to height of 1760/280 royal cubits equates to 2π to an accuracy of better than 0.05% (corresponding to the well-known approximation of π as 22/7). Some Egyptologists consider this to have been the result of deliberate design proportion. 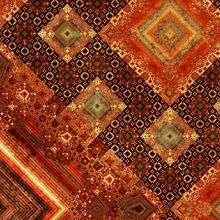 Verner wrote, "We can conclude that although the ancient Egyptians could not precisely define the value of π, in practice they used it". Petrie, author of Pyramids and Temples of Gizeh concluded: "but these relations of areas and of circular ratio are so systematic that we should grant that they were in the builder's design". Others have argued that the Ancient Egyptians had no concept of pi and would not have thought to encode it in their monuments. They believe that the observed pyramid slope may be based on a simple seked slope choice alone, with no regard to the overall size and proportions of the finished building. In 2013 rolls of papyrus were discovered written by some of those who delivered stone and other construction materials to Khufu's brother at Giza. The Great Pyramid consists of an estimated 2.3 million blocks which most believe to have been transported from nearby quarries. The Tura limestone used for the casing was quarried across the river. The largest granite stones in the pyramid, found in the "King's" chamber, weigh 25 to 80 tonnes and were transported from Aswan, more than 800 km (500 mi) away. Traditionally, ancient Egyptians cut stone blocks by hammering into them some wooden wedges, which were then soaked with water. As the water was absorbed, the wedges expanded, causing the rock to crack. Once they were cut, they were carried by boat either up or down the Nile River to the pyramid. It is estimated that 5.5 million tonnes of limestone, 8,000 tonnes of granite (imported from Aswan), and 500,000 tonnes of mortar were used in the construction of the Great Pyramid. Casing stone in the British Museum. At completion, the Great Pyramid was surfaced by white "casing stones" – slant-faced, but flat-topped, blocks of highly polished white limestone. These were carefully cut to what is approximately a face slope with a seked of 5½ palms to give the required dimensions. Visibly, all that remains is the underlying stepped core structure seen today. In AD 1303, a massive earthquake loosened many of the outer casing stones, which were then carted away by Bahri Sultan An-Nasir Nasir-ad-Din al-Hasan in 1356 to build mosques and fortresses in nearby Cairo. Many more casing stones were removed from the great pyramids by Muhammad Ali Pasha in the early 19th century to build the upper portion of his Alabaster Mosque in Cairo not far from Giza. These limestone casings can still be seen as parts of these structures. Later explorers reported massive piles of rubble at the base of the pyramids left over from the continuing collapse of the casing stones, which were subsequently cleared away during continuing excavations of the site. Nevertheless, a few of the casing stones from the lowest course can be seen to this day in situ around the base of the Great Pyramid, and display the same workmanship and precision that has been reported for centuries. Petrie also found a different orientation in the core and in the casing measuring 193 centimetres ± 25 centimetres. He suggested a redetermination of north was made after the construction of the core, but a mistake was made, and the casing was built with a different orientation. Petrie related the precision of the casing stones as to being "equal to opticians' work of the present day, but on a scale of acres" and "to place such stones in exact contact would be careful work; but to do so with cement in the joints seems almost impossible". It has been suggested it was the mortar (Petrie's "cement") that made this seemingly impossible task possible, providing a level bed, which enabled the masons to set the stones exactly. Clay seal bearing the name of Khufu from the great pyramid. On display at the Musée du Louvre. Many alternative, often contradictory, theories have been proposed regarding the pyramid's construction techniques. Many disagree on whether the blocks were dragged, lifted, or even rolled into place. The Greeks believed that slave labour was used, but modern discoveries made at nearby workers' camps associated with construction at Giza suggest that it was built instead by tens of thousands of skilled workers. Verner posited that the labour was organized into a hierarchy, consisting of two gangs of 100,000 men, divided into five zaa or phyle of 20,000 men each, which may have been further divided according to the skills of the workers. One mystery of the pyramid's construction is its planning. John Romer suggests that they used the same method that had been used for earlier and later constructions, laying out parts of the plan on the ground at a 1-to-1 scale. He writes that "such a working diagram would also serve to generate the architecture of the pyramid with precision unmatched by any other means". He also argues for a 14-year time span for its construction. A modern construction management study, in association with Mark Lehner and other Egyptologists, estimated that the total project required an average workforce of 14,567 people and a peak workforce of roughly 40,000. Without the use of pulleys, wheels, or iron tools, they used critical path analysis methods, which suggest that the Great Pyramid was completed from start to finish in approximately 10 years. Diagram of the interior structures of the Great Pyramid. The inner line indicates the pyramid's present profile; the outer line indicates the original profile. The original entrance to the Great Pyramid is 17 metres (56 ft) vertically above ground level and 7.29 metres (23.9 ft) east of the centre line of the pyramid. From this original entrance, there is a Descending Passage 0.96 metres (3.1 ft) high and 1.04 metres (3.4 ft) wide, which goes down at an angle of 26° 31'23" through the masonry of the pyramid and then into the bedrock beneath it. After 105.23 metres (345.2 ft), the passage becomes level and continues for an additional 8.84 metres (29.0 ft) to the lower Chamber, which appears not to have been finished. There is a continuation of the horizontal passage in the south wall of the lower chamber; there is also a pit dug in the floor of the chamber. Some Egyptologists suggest that this Lower Chamber was intended to be the original burial chamber, but Pharaoh Khufu later changed his mind and wanted it to be higher up in the pyramid. At 28.2 metres (93 ft) from the entrance is a square hole in the roof of the Descending Passage. Originally concealed with a slab of stone, this is the beginning of the Ascending Passage. The Ascending Passage is 39.3 metres (129 ft) long, as wide and high as the Descending Passage and slopes up at almost precisely the same angle. The lower end of the Ascending Passage is closed by three huge blocks of granite, each about 1.5 metres (4.9 ft) long. At the start of the Grand Gallery on the right-hand side there is a hole cut in the wall. This is the start of a vertical shaft which follows an irregular path through the masonry of the pyramid to join the Descending Passage. Also at the start of the Grand Gallery there is the Horizontal Passage leading to the "Queen's Chamber". The passage is 1.1m (3'8") high for most of its length, but near the chamber there is a step in the floor, after which the passage is 1.73 metres (5.7 ft) high. Richard Pococke's sketch of Pyramid of Cheops from 1754. The "Queen's Chamber" is exactly halfway between the north and south faces of the pyramid and measures 5.75 metres (18.9 ft) north to south, 5.23 metres (17.2 ft) east to west, and has a pointed roof with an apex 6.23 metres (20.4 ft) above the floor. At the eastern end of the chamber there is a niche 4.67 metres (15.3 ft) high. The original depth of the niche was 1.04 metres (3.4 ft), but has since been deepened by treasure hunters. In the north and south walls of the Queen's Chamber there are shafts, which unlike those in the King's Chamber that immediately slope upwards, are horizontal for around 2 m (6.6 ft) before sloping upwards. The horizontal distance was cut in 1872 by a British engineer, Waynman Dixon, who believed a similar shaft to the King's Chamber must also exist. He was proved right, but because the shafts are not connected to the outer faces of the pyramid or the Queen's Chamber, their purpose is unknown. At the end of one of his shafts, Dixon discovered a ball of black diorite (a type of rock) and a bronze implement of unknown purpose. Both objects are currently in the British Museum. The shafts in the Queen's Chamber were explored in 1993 by the German engineer Rudolf Gantenbrink using a crawler robot he designed, Upuaut 2. After a climb of 65 m (213 ft), he discovered that one of the shafts was blocked by limestone "doors" with two eroded copper "handles". Some years later the National Geographic Society created a similar robot which, in September 2002, drilled a small hole in the southern door, only to find another door behind it. The northern passage, which was difficult to navigate because of twists and turns, was also found to be blocked by a door. Research continued in 2011 with the Djedi Project. Realizing the problem was that the National Geographic Society's camera was only able to see straight ahead of it, they instead used a fiber-optic "micro snake camera" that could see around corners. With this they were able to penetrate the first door of the southern shaft through the hole drilled in 2002, and view all the sides of the small chamber behind it. They discovered hieroglyphs written in red paint. They were also able to scrutinize the inside of the two copper "handles" embedded in the door, and they now believe them to be for decorative purposes. They also found the reverse side of the "door" to be finished and polished, which suggests that it was not put there just to block the shaft from debris, but rather for a more specific reason. The Grand Gallery continues the slope of the Ascending Passage, but is 8.6 metres (28 ft) high and 46.68 metres (153.1 ft) long. At the base it is 2.06 metres (6.8 ft) wide, but after 2.29 metres (7.5 ft) the blocks of stone in the walls are corbelled inwards by 7.6 centimetres (3.0 in) on each side. There are seven of these steps, so, at the top, the Grand Gallery is only 1.04 metres (3.4 ft) wide. It is roofed by slabs of stone laid at a slightly steeper angle than the floor of the gallery, so that each stone fits into a slot cut in the top of the gallery like the teeth of a ratchet. The purpose was to have each block supported by the wall of the Gallery rather than resting on the block beneath it, which would have resulted in an unacceptable cumulative pressure at the lower end of the Gallery. At the upper end of the Gallery on the right-hand side there is a hole near the roof that opens into a short tunnel by which access can be gained to the lowest of the Relieving Chambers. The other Relieving Chambers were discovered in 1837-1838 by Colonel Howard Vyse and J. S. Perring, who dug tunnels upwards using blasting powder. The floor of the Grand Gallery consists of a shelf or step on either side, 51 centimetres (20 in) wide, leaving a lower ramp 1.04 metres (3.4 ft) wide between them. In the shelves there are 54 slots, 27 on each side matched by vertical and horizontal slots in the walls of the Gallery. These form a cross shape that rises out of the slot in the shelf. The purpose of these slots is not known, but the central gutter in the floor of the Gallery, which is the same width as the Ascending Passage, has led to speculation that the blocking stones were stored in the Grand Gallery and the slots held wooden beams to restrain them from sliding down the passage. This, in turn, has led to the proposal that originally many more than 3 blocking stones were intended, to completely fill the Ascending Passage. At the top of the Grand Gallery, there is a step giving onto a horizontal passage some metres long and approximately 1.02 metres (3.3 ft) in height and width, in which can be detected four slots, three of which were probably intended to hold granite portcullises. Fragments of granite found by Petrie in the Descending Passage may have come from these now-vanished doors. The "King's Chamber" is 10.47 metres (34.4 ft) from east to west and 5.234 metres (17.17 ft) north to south. It has a flat roof 5.82 metres (19 feet 1 inch) above the floor. 0.91 m (3.0 ft) above the floor there are two narrow shafts in the north and south walls (one is now filled by an extractor fan in an attempt to circulate air inside the pyramid). The purpose of these shafts is not clear: they appear to be aligned towards stars or areas of the northern and southern skies, yet one of them follows a dog-leg course through the masonry, indicating no intention to directly sight stars through them. They were long believed by Egyptologists to be "air shafts" for ventilation, but this idea has now been widely abandoned in favour of the shafts serving a ritualistic purpose associated with the ascension of the king’s spirit to the heavens. The King's Chamber is entirely faced with granite. Above the roof, which is formed of nine slabs of stone weighing in total about 400 tons, are five compartments known as Relieving Chambers. The first four, like the King's Chamber, have flat roofs formed by the floor of the chamber above, but the final chamber has a pointed roof. Vyse suspected the presence of upper chambers when he found that he could push a long reed through a crack in the ceiling of the first chamber. From lower to upper, the chambers are known as "Davison's Chamber", "Wellington's Chamber", "Nelson's Chamber", "Lady Arbuthnot's Chamber", and "Campbell's Chamber". It is believed that the compartments were intended to safeguard the King's Chamber from the possibility of a roof collapsing under the weight of stone above the Chamber. As the chambers were not intended to be seen, they were not finished in any way and a few of the stones still retain masons' marks painted on them. One of the stones in Campbell's Chamber bears a mark, apparently the name of a work gang. The only object in the King's Chamber is a rectangular granite sarcophagus, one corner of which is broken. The sarcophagus is slightly larger than the Ascending Passage, which indicates that it must have been placed in the Chamber before the roof was put in place. Unlike the fine masonry of the walls of the Chamber, the sarcophagus is roughly finished, with saw marks visible in several places. This is in contrast with the finely finished and decorated sarcophagi found in other pyramids of the same period. Petrie suggested that such a sarcophagus was intended but was lost in the river on the way north from Aswan and a hurriedly made replacement was used instead. Today tourists enter the Great Pyramid via the Robbers' Tunnel, a tunnel created around AD 820 by Caliph al-Ma'mun's workmen using a battering ram. The tunnel is cut straight through the masonry of the pyramid for approximately 27 metres (89 ft), then turns sharply left to encounter the blocking stones in the Ascending Passage. It is believed that their efforts dislodged the stone fitted in the ceiling of the Descending Passage to hide the entrance to the Ascending Passage and it was the noise of that stone falling and then sliding down the Descending Passage, which alerted them to the need to turn left. Unable to remove these stones, however, the workmen tunnelled up beside them through the softer limestone of the Pyramid until they reached the Ascending Passage. It is possible to enter the Descending Passage from this point, but access is usually forbidden. 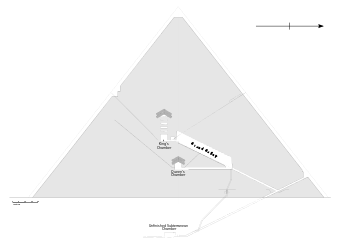 Map of Giza pyramid complex – "Pyramid of Khufu" refers to the Great Pyramid. The Great Pyramid is surrounded by a complex of several buildings including small pyramids. The Pyramid Temple, which stood on the east side of the pyramid and measured 52.2 metres (171 ft) north to south and 40 metres (130 ft) east to west, has almost entirely disappeared apart from the black basalt paving. There are only a few remnants of the causeway which linked the pyramid with the valley and the Valley Temple. The Valley Temple is buried beneath the village of Nazlet el-Samman; basalt paving and limestone walls have been found but the site has not been excavated. The basalt blocks show "clear evidence" of having been cut with some kind of saw with an estimated cutting blade of 15 feet (4.6 m) in length, capable of cutting at a rate of 1.5 inches (38 mm) per minute. John Romer suggests that this "super saw" may have had copper teeth and weighed up to 300 pounds (140 kg). He theorizes that such a saw could have been attached to a wooden trestle and possibly used in conjunction with vegetable oil, cutting sand, emery or pounded quartz to cut the blocks, which would have required the labour of at least a dozen men to operate it. On the south side are the subsidiary pyramids, popularly known as Queens' Pyramids. Three remain standing to nearly full height but the fourth was so ruined that its existence was not suspected until the recent discovery of the first course of stones and the remains of the capstone. Hidden beneath the paving around the pyramid was the tomb of Queen Hetepheres I, sister-wife of Sneferu and mother of Khufu. Discovered by accident by the Reisner expedition, the burial was intact, though the carefully sealed coffin proved to be empty. Group photo of Australian 11th Battalion soldiers on the Great Pyramid in 1915. The Giza pyramid complex, which includes among other structures the pyramids of Khufu, Khafre and Menkaure, is surrounded by a cyclopean stone wall, the Wall of the Crow. Mark Lehner has discovered a worker's town outside of the wall, otherwise known as "The Lost City", dated by pottery styles, seal impressions, and stratigraphy to have been constructed and occupied sometime during the reigns of Khafre (2520–2494 BC) and Menkaure (2490–2472 BC). Recent discoveries by Mark Lehner and his team at the town and nearby, including what appears to have been a thriving port, suggest the town and associated living quarters consisting of barracks called "galleries" may not have been for the pyramid workers after all, but rather for the soldiers and sailors who utilized the port. In light of this new discovery, as to where then the pyramid workers may have lived Lehner now suggests the alternative possibility they may have camped on the ramps he believes were used to construct the pyramids or possibly at nearby quarries. In the early 1970s, the Australian archaeologist Karl Kromer excavated a mound in the South Field of the plateau. This mound contained artefacts including mudbrick seals of Khufu, which he identified with an artisans' settlement. Mudbrick buildings just south of Khufu's Valley Temple contained mud sealings of Khufu and have been suggested to be a settlement serving the cult of Khufu after his death. A worker's cemetery used at least between Khufu's reign and the end of the Fifth Dynasty was discovered south of the Wall of the Crow by Zahi Hawass in 1990. There are three boat-shaped pits around the pyramid, of a size and shape to have held complete boats, though so shallow that any superstructure, if there ever was one, must have been removed or disassembled. In May 1954, the Egyptian archaeologist Kamal el-Mallakh discovered a fourth pit, a long, narrow rectangle, still covered with slabs of stone weighing up to 15 tons. Inside were 1,224 pieces of wood, the longest 23 metres (75 ft) long, the shortest 10 centimetres (0.33 ft). These were entrusted to a boat builder, Haj Ahmed Yusuf, who worked out how the pieces fit together. The entire process, including conservation and straightening of the warped wood, took fourteen years. The result is a cedar-wood boat 43.6 metres (143 ft) long, its timbers held together by ropes, which is currently housed in a special boat-shaped, air-conditioned museum beside the pyramid. During construction of this museum, which stands above the boat pit, a second sealed boat pit was discovered. It was deliberately left unopened until 2011 when excavation began on the boat. Comparison of approximate profiles of the Great Pyramid of Giza with some notable pyramidal or near-pyramidal buildings. Dotted lines indicate original heights, where data are available. In its SVG file, hover over a pyramid to highlight and click for its article. Although succeeding pyramids were smaller, pyramid building continued until the end of the Middle Kingdom. However, as authors Briar and Hobbs claim, "all the pyramids were robbed" by the New Kingdom, when the construction of royal tombs in a desert valley, now known as the Valley of the Kings, began. 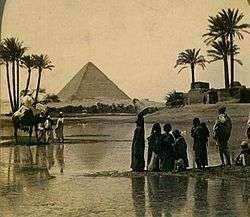 Joyce Tyldesley states that the Great Pyramid itself "is known to have been opened and emptied by the Middle Kingdom", before the Arab caliph Abdullah al-Mamun entered the pyramid around AD 820. I. E. S. Edwards discusses Strabo's mention that the pyramid "a little way up one side has a stone that may be taken out, which being raised up there is a sloping passage to the foundations". Edwards suggested that the pyramid was entered by robbers after the end of the Old Kingdom and sealed and then reopened more than once until Strabo's door was added. He adds: "If this highly speculative surmise be correct, it is also necessary to assume either that the existence of the door was forgotten or that the entrance was again blocked with facing stones", in order to explain why al-Ma'mun could not find the entrance. He also discusses a story told by Herodotus. Herodotus visited Egypt in the 5th century BC and recounts a story that he was told concerning vaults under the pyramid built on an island where the body of Cheops lies. Edwards notes that the pyramid had "almost certainly been opened and its contents plundered long before the time of Herodotus" and that it might have been closed again during the Twenty-sixth Dynasty of Egypt when other monuments were restored. He suggests that the story told to Herodotus could have been the result of almost two centuries of telling and retelling by Pyramid guides. ↑ I. E. S. Edwards (1986) . The Pyramids of Egypt. p. 285. ↑ Petrie (1883), p. 38 For 2600 BC, bisecting the semi-circular path of star 10i Draconis around the North Celestial Pole during the half-day darkness of a mid-winter evening would easily provide accurate true north. See Nature 412:699 (2001); further sources and discussion available via DIO. ↑ Stille, Alexander. "The World's Oldest Papyrus and What It Can Tell Us About the Great Pyramids". Retrieved 2015-09-27. 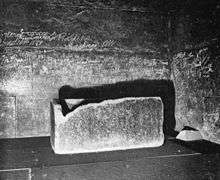 ↑ "British Museum – Limestone block from the pyramid of Khufu". britishmuseum.org. ↑ Clarke, Somers; Reginal Engelbach (1991). Ancient Egyptian construction and architecture. Dover Publications. pp. 78–79. ISBN 978-0-486-26485-1. ↑ Stocks, Denys Allen (2003). Experiments in Egyptian archaeology: stoneworking technology in ancient Egypt. Routledge. pp. 182–183. ISBN 978-0-415-30664-5. ↑ "Building the Great Pyramid". BBC. 3 February 2006. ↑ "Civil Engineering". June 1999. Archived from the original on 8 June 2007. ↑ "Unfinished Chamber". Public Broadcasting Service. Retrieved 11 August 2008. ↑ "Lower Northern Shaft". The Upuaut Project. Retrieved 11 October 2010. ↑ "Will the Great Pyramid's Secret Doors Be Opened?". Fox News. 12 December 2011. Archived from the original on 12 February 2012. ↑ Gupton, Nancy (4 April 2003). "Ancient Egyptian Chambers Explored". National Geographic. Retrieved 11 August 2008. 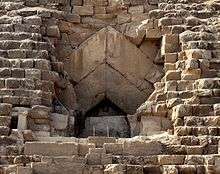 ↑ "Third "Door" Found in Great Pyramid". National Geographic. 23 September 2002. Retrieved 11 August 2008. ↑ "First images from Great Pyramid's chamber of secrets". New Scientist. Reed Business Information. 25 May 2011. Retrieved 25 December 2012. ↑ Lehner, Mark (1997). The Complete Pyramids. London: Thames and Hudson. p. 113. ISBN 0-500-05084-8. ↑ "Vyse, H. (1840) Operations Carried on at the Pyramids of Gizeh in 1837: With an Account of a Voyage into Upper Egypt, and an Appendix. Vol I.". Internet Archive. Retrieved 15 September 2014. ↑ "Dallas and Dr Zahi Hawass inside the Great Pyramid". BBC. Retrieved 15 September 2014. ↑ Shafer, Byron E.; Dieter Arnold (2005). Temples of Ancient Egypt. I.B. Tauris. pp. 51–52. ISBN 978-1-85043-945-5. ↑ Arnold, Dieter; Nigel Strudwick; Helen Strudwick (2002). The encyclopaedia of ancient Egyptian architecture. I.B. Tauris. p. 126. ISBN 978-1-86064-465-8. 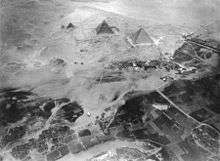 ↑ "Egyptian Pyramids – Lost City of the Pyramid Builders – AERA – Ancient Egypt Research Associates". aeraweb.org. ↑ "Dating the Lost City of the Pyramids – Mark Lehner & AERA – Ancient Egypt Research Associates". aeraweb.org. ↑ "Ruins of Bustling Port Unearthed at Egypt's Giza Pyramids". Livescience.com. 2014-01-28. Retrieved 2014-08-21. ↑ Hawass, Zahi; Ashraf Senussi (2008). Old Kingdom Pottery from Giza. Supreme Council of Antiquities. pp. 127–128. ISBN 978-977-305-986-6. ↑ Hawass, Zahi. "The Discovery of the Tombs of the Pyramid Builders at Giza". Retrieved 21 October 2010. ↑ "Khufu's Second Boat". Institute of Egyptology. Tokyo, Japan: Waseda University. Retrieved 2012-12-26. ↑ Brier 1999, p. 164. Books.google.co.uk. Retrieved 19 May 2011. ↑ Cremin 2007 p. 96. Books.google.co.uk. Retrieved 19 May 2011. Bauval, Robert &, Hancock, Graham (1996). Keeper of Genesis. Mandarin books. ISBN 0-7493-2196-2. Brier, Bob &, Hobbs, A. Hoyt (1999). Daily Life of the Ancient Egyptians. Greenwood Press. ISBN 978-0-313-30313-5. Calter, Paul A. (2008). Squaring the Circle: Geometry in Art and Architecture. Key College Publishing. ISBN 1-930190-82-4. Clayton, Peter A. (1994). Chronicle of the Pharaohs. Thames & Hudson. ISBN 0-500-05074-0. Cole, JH. (1925). Determination of the Exact Size and Orientation of the Great Pyramid of Giza. Cairo: Government Press. SURVEY OF EGYPT Paper No. 39. Collins, Dana M. (2001). The Oxford Encyclopedia of Ancient Egypt. Oxford University Press. ISBN 978-0-19-510234-5. Cremin, Aedeen (2007). Archaeologica. Frances Lincoln. ISBN 978-0-7112-2822-1. Edwards, I. E. S. (1986) . The Pyramids of Egypt. Max Parrish. Gahlin, Lucia (2003). Myths and Mythology of Ancient Egypt. Anness Publishing Ltd. ISBN 1-84215-831-7. Hassan, Selim (1960). 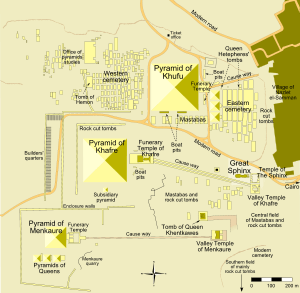 The Great Pyramid of Khufu and its Mortuary Chapel With Names and Titles of Vols. I-X of the Excavations at Giza (PDF). Ministry of Culture and National Orientation, Antiquities Department of Egypt. Jackson, K.; Stamp, J. (2002). Pyramid : Beyond Imagination. Inside the Great Pyramid of Giza. BBC Worldwide Ltd. ISBN 978-0-563-48803-3. Lehner, Mark (1997). The Complete Pyramids. London: Thames and Hudson. ISBN 0-500-05084-8. Levy, Janey (2005). The Great Pyramid of Giza: Measuring Length, Area, Volume, and Angles. Rosen Publishing Group. ISBN 1-4042-6059-5. Lepre, J.P. (1990). The Egyptian Pyramids: A Comprehensive, Illustrated Reference. McFarland & Company. ISBN 0-89950-461-2. Lightbody, David I (2008). Egyptian Tomb Architecture: The Archaeological Facts of Pharaonic Circular Symbolism. British Archaeological Reports International Series S1852. ISBN 978-1-4073-0339-0. Oakes, Lorana; Lucia Gahlin (2002). Ancient Egypt. Hermes House. ISBN 1-84309-429-0. Petrie, Sir William Matthew Flinders (1883). The Pyramids and Temples of Gizeh. Field & Tuer. ISBN 0-7103-0709-8. Romer, John (2007). The Great Pyramid: Ancient Egypt Revisited. Cambridge University Press, Cambridge. ISBN 978-0-521-87166-2. Scarre, Chris (1999). The Seventy Wonders of the Ancient World. Thames & Hudson, London. ISBN 978-0-500-05096-5. Seidelmann, P. Kenneth (1992). Explanatory Supplement to the Astronomical Almanac. University Science Books. ISBN 0-935702-68-7. Shaw, Ian (2003). The Oxford History of Ancient Egypt. Oxford University Press. ISBN 0-19-815034-2. Siliotti, Alberto (1997). Guide to the pyramids of Egypt; preface by Zahi Hawass. Barnes & Noble Books. ISBN 0-7607-0763-4. Smyth, Piazzi (1978). The Great Pyramid. Crown Publishers Inc. ISBN 0-517-26403-X. Tyldesley, Joyce (2007). Egypt: How a lost civilization was rediscovered. BBC Books. ISBN 978-0-563-52257-7. Verner, Miroslav (2001). The Pyramids: The Mystery, Culture, and Science of Egypt's Great Monuments. Grove Press. ISBN 0-8021-1703-1. Verner, Miroslav (2003). The Pyramids: Their Archaeology and History. Atlantic Books. ISBN 1-84354-171-8. Wirsching, Armin (2009). Die Pyramiden von Giza – Mathematik in Stein gebaut (2nd ed.). Books on Demand. ISBN 978-3-8370-2355-8. Wikimedia Commons has media related to Great Pyramid of Giza. "The Giza Plateau Mapping Project". Oriental Institute.